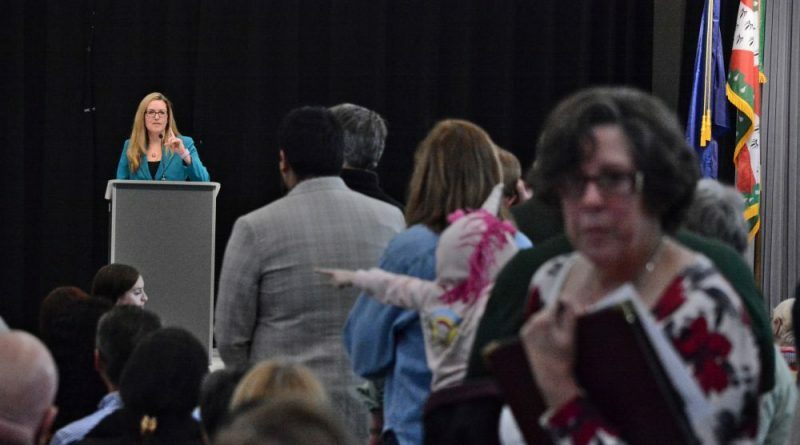 U.S. Rep. Jennifer T. Wexton’s first town hall since taking office filled the gym at Goshen Post Elementary School on Sunday and faced the freshman congresswoman with questions on national issues. One of the first questions Wexton (D-VA-10) faced was on an issue still hovering over Democrats in Virginia—revelations of racist pictures on Gov. Ralph Northam’s medical school yearbook page, and an admission by Virginia Attorney General Mark Herring that he had dressed up in blackface for a party. Wexton, like other Democrats, drew a distinction between the two. She has previously called on Northam to resign, but not Herring, who lives in her district in Leesburg. Another attendee asked her about tweets about the American-Israeli relationship by Minnesota Democratic Representative Ilhan Omar that many have taken to be anti-Semitic. While she was critical of Omar’s comments, Wexton also said there is a larger issue at play, and that not all the criticism of Omar’s comments may be in good faith. Some at the town hall also pushed Wexton to get behind the Green New Deal, a set of economic stimulus programs intended to tackle climate change and income inequality, a response in part to warnings from international climate experts that the world has 12 years to take dramatic steps to avert significant climate-change related effects such as increased flooding, droughts, and food shortages. Wexton demurred, saying there are not enough policy specifics for her to assess the Green New Deal’s efficacy and impact. “Because it’s something that early touches on every aspect of our economy and our society, I would just hesitate to sign on without full information to assess its impact,” Wexton said. And another asked Wexton about term limits. “I think that having term limits could definitely help with accountability and people coming in and not feeling that they have to succumb to special interests and things like that, but I would worry also about the learning curve and the continuity of knowledge, about that sort of thing,” Wexton said. She began the town hall with a rundown of some of what she’s been doing in the nation’s capitol since taking office in January, including introducing and passing the FinCEN Improvement Act through the House of Representatives, a bill aimed at modernizing the U.S. Department of the Treasury’s Financial Crimes Enforcement Network. According to Wexton’s office, it would update the law to allow the office to recognize tribal law enforcement agencies, prioritize protection against terrorism, and focus on emerging methods of terrorism and illicit finance, including cryptocurrencies. The bill passed unanimously in the House of Representatives and is under review by the Senate Committee on Banking, Housing, and Urban Affairs. After a meeting with fourth graders at Goshen Post, Wexton said, she is also co-patroning a bill prohibiting importing shark fins and shark finning in U.S. waters—an issue the students were studying. Wexton’s office has said it was the first of several town halls the congresswoman will hold across the 10th District. I wonder if she also supports the Green New Deal and a border fence. 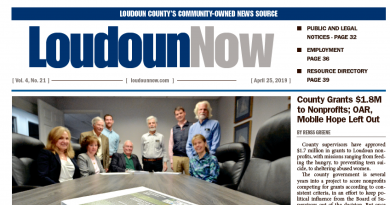 But the key thing here is that our congressmember gave no notice of this town hall to the newspapers (Loudoun Now only publicized it Friday afternoon) and the other paper did not seem to publicize it at all nor did they cover it. Secondly, it was held at 1130 to 1 on a Sunday when many people (notably conservative Christians ) are in church. It also was St. Patrick’s Day. It seems most of the audience were Democrats or supporters of Wexton, which means they got notice. Perhaps Wexton was concerned about rabid Republicans coming to her event, but Republicans don’t get rabid and in your face like liberal protesters, and we don’t fire shots at Democratic Congressmembers either.. So, with that, I hope Ms. wexton will give more notice of her next forum, but it sure seemed like she was trying to hide this one.